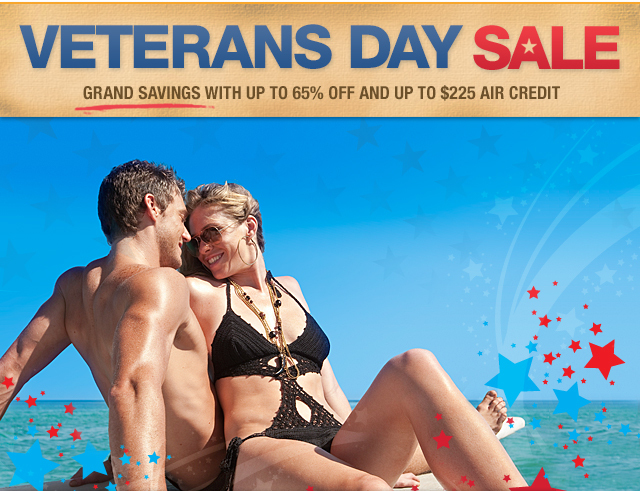 GRAND PINEAPPLE BEACH RESORT - Celebrate this Veterans Day with Grand Savings up to 65% OFF and Air Credit Up to $225 !!! Located on one of the island's most beautiful and serene beaches, Long Bay Beach, Grand Pineapple Antigua has the charming feel of the islands that has made the Caribbean so popular. 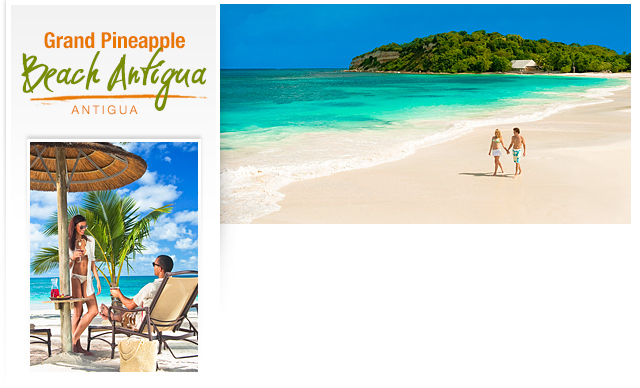 Schedule your all-inclusive vacation to Antigua at Grand Pineapple. On Negril's Seven-Mile Beach, considered to be among the beaches in the world, our great, affordable family vacations at Grand Pineapple Beach Negril surrounds you with all the charm of the Caribbean with colorful cottages. 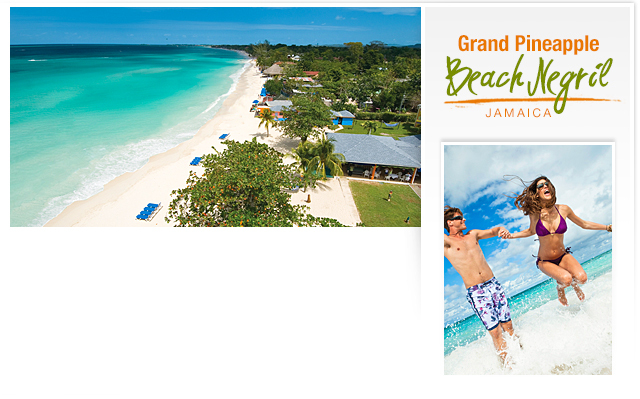 Up to 65% offer is valid for bookings made by Nov. 8, 2013 for travel on select dates at Grand Pineapple Beach Negril. Up to 60% offer is valid for bookings made by Nov. 8, 2013 for travel on select dates at Grand Pineapple Beach Antigua. Blackout dates apply. Offer may be canceled without notice and may be subject to certain restrictions. Roundtrip transfers not included. Offer subject to termination without notice. Instant Air Credit offer is valid for new U.S. and Canadian bookings only starting Sept. 4, 2013 until further notice at Grand Pineapple Beach Antigua. Air Credit must be booked in conjunction with a land only or air-inclusive vacation package with a required min. stay of 6-paid nights to get the $225 air credit or 3 to 5 paid-nights to get the $125 air credit for travel between Sept. 4, 2013 - Dec. 21, 2014 in a consecutive stay when flying from any city in the U.S. or Canada. Limit of one Air Credit per booked room and double occupancy is required. For air inclusive bookings, the Air Credit is in USD, applied to the base fare and excludes government taxes and fees, which must be paid at time of booking and is fully nonrefundable. Baggage fees may not be included. Both passengers must be booked for the same flight and itinerary cannot include voluntary stopovers. Offer is combinable with other consumer savings promotions. Cancellation of hotel booking will result in cancellation of all associated airline tickets. Blackout dates may apply. Offer is subject to availability throughout promotional period and may be changed or withdrawn at any time. This email was sent to you by Unique Vacations, Inc., Worldwide Representative of Grand Pineapple Beach Resorts. To ensure delivery to your inbox (not bulk or junk folders), please add sales@e.grandpineapplemailings.com to your address book. Your privacy is important to us, which is why we offer you every opportunity to unsubscribe from our mailing list. Written inquiries can be sent to Unique Vacations, Inc., 4950 S.W. 72 Ave., Miami, FL 33155.